Freedom to move: If you unexpectedly need to find less-expensive housing or move to a different location, as a renter you won’t have to worry about the risk of selling a home for less money than you paid for it. This situation of owing more than your home is worth could occur if there were an over-supply of housing on the market. 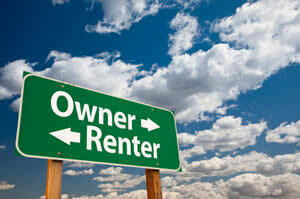 And, if you are already planning to move in just a few years, renting is often a better choice financially. “Even if the value of your home goes up during that short time period, the costs associated with selling it would likely exceed your profits,” said Evelyn Manley, a Senior Consumer Affairs Specialist at the FDIC. Smaller up-front costs: “Renting may be the way to go if you don’t have the cash needed for a down payment on a home and for closing costs on a mortgage,” noted FDIC Consumer Affairs Specialist Heather St. Germain. For renters, the big initial payout is a month or two of rent as a security deposit. Compare that to the tens of thousands of dollars that many homebuyers need for a down payment, plus closing costs. St. Germain also said that if you don’t have a certain amount for a down payment — generally 20 percent of the home’s value — the lender may require you to also pay for mortgage insurance, which will add to the cost of your loan. No need to worry about major maintenance costs: As a renter, you’re unlikely to be responsible for replacing a leaking roof or a broken furnace. Monthly costs are often lower: Rent-related expenses usually will be less than what a homeowner would pay each month in “PITI” — principal and interest on a mortgage, property taxes and homeowner’s insurance. If you rent, you should purchase renter’s insurance, which is likely to be less costly than homeowner’s insurance for a comparable property. Wealth creation: By paying the mortgage each month over many years, you will likely build up equity (the current value of the home minus what you owe on your loan) for a down payment for your next home or for some other purpose, such as retirement. And, if you live in a home long enough to pay off the mortgage, you will have a valuable asset to sell or leave to a family member. “In contrast, after 30 years of paying rent, you will have nothing to show for it in terms of a home that also will serve as your nest egg,” said Manley. If you pay off your mortgage, you’ll also have one fewer payment to worry about each month (although you will still have to pay for real estate taxes, insurance, repairs and any homeowner or condominium association fees). Fixed-rate mortgages add stability: “Landlords can raise rents, but if you buy a home with a fixed-rate mortgage, most of your monthly payment — the part not including real estate taxes or insurance — won’t change for 30 years, 15 years, or however long you have that mortgage,” said Glenn Gimble, an FDIC Senior Policy Analyst. It’s important to remember, though, that taxes or insurance could still go up. How can you learn more about renting vs. buying a home? A good place to start is the “Buying a Home” page on the U.S. Department of Housing and Urban Development (HUD) Web site at http://go.usa.gov/Xu6. And, to speak to a HUD-sponsored counseling agency that can offer free or low-cost advice on renting or buying a home, visit www.hud.gov/offices/hsg/sfh/hcc/hcs.cfm or call 1-800-569-4287.